Our Carnival Mas Camp, when you can join in the making for our yearly productions is back! Drop in to learn new skills, volunteer and learn about carnival. To keep in the loop subscribe to our newsletter by dropping us an email on adminATsunshineiarts.co.uk. All Mas Bands (Mas- as in Masquerades – Band- the group of people dressed in costumes) have headquarters. A Mas Camp is a camp set up for the production of carnival costumes. Mas Camp is open to all. 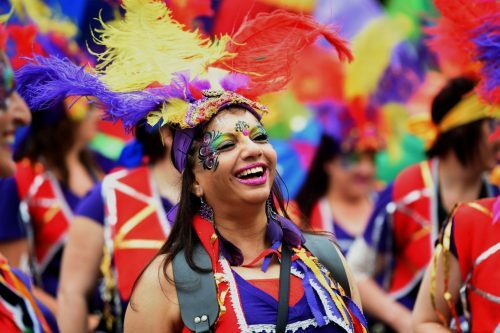 This is also a place to meet people, learn about making costume, explore your creativity, socialise, listen to the latest carnival music- Soca ( and some of the oldies Calypso), eat homemade curries and enjoy the melting pot of the culture of carnival. Come along to our Mas Camp and meet our Artistic Director, Ray Mahabir. This is a unique opportunity to ask questions and learn about carnival from a designer who has worked in the sector for over three decades. The only Carnival Cafe in the UK !London is the capital of foodies, but it’s not so easy to find Buss Up Shut!!! (OR: But it’s not so easy to find home-made traditional Trinidadian R@Y’s curry and Roti!) Here at C.A.F.E we offer hot daily lunches BOX!! (from just £4.50!) and a fully stocked bar, in a relaxed and creative atmosphere. We specialise in Trinidadian food, so come and grab one of our meat or vegan lunches, chill out with our free wi-fi, or put a spring in your step with our homemade rum punch! !